There’s nothing like spending a Sunday afternoon listening to a full orchestra and watching two star-crossed lovers dance their way to their death. 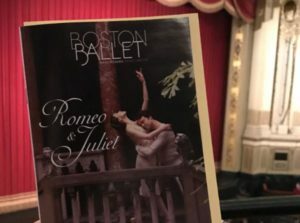 As the Boston Ballet’s rendition of Romeo and Juliet came to a close on April 8th, I was fortunate enough to see one of the last performances of the production. The classic ballet attracted people of all ages, from squealing little girls who pretended to throw up as the dancers kissed, to older couples with a look in their eyes that told me they remembered the days of teenage love. I too found myself entranced in the romantic story, and drawn into the world of fair Verona. As it is a ballet, the story of Romeo and Juliet is told through dance and music. To some who are not familiar with the story, it may have been hard to follow the actions of the characters. The program provided a summary of each scene and one could get a general idea of the story through the movement and music, but to get the most out of it, it is better to come with a good amount of knowledge of the events of the plot and the characters motivations. That being said, it is not the best ballet to take younger children to because they may get antsy and confused. As a literature lover, I enjoyed the way the story was presented and I only referenced the summary of scenes in the program a few times to freshen my memory. Something that I appreciated was the sense of comedy within this drama. There were several moments where the quiet Sunday crowd burst out laughing. It is important to have comedic relief within a drama to keep the audience engaged. The characters of Benvolio and Mercutio were especially hilarious. Their signature moves involved head bobbing, and waving their arms in jester-like fashion to attract the young women. These two characters combined with Romeo took upon a role of the dashing Three Stooges, often messing with each other and other people within the story. Their physical comedy combined with teenage boy foolishness created comic relief in every scene they were in. The only part where I found the comedy did not fit in was during Mercutio’s death scene. He is stabbed by Tybalt, yet he dies for at least three minutes. He stumbles around the stage, kissing girls and drinking beer. It seems out of place, and I expected a more noble death, as it sparks the conflict for the rest of the story. The dancers’ acting in this production was phenomenal. Even for someone sitting in the last row, there was no way that they couldn’t feel the emotions rolling off the dancers and into the audience. I also could see the difference in personalities of each character. Misa Kuranaga played Juliet as a bubbly, confident girl, while Paulo Arrais gave Romeo a noble, and somewhat typical, teenage charm. The rest of the characters also had their own distinct personalities that the dancers played well. With all of the acting and storytelling on the stage, there was less room for the dancers to show their fantastic talent. Pedestrian dancing was the prominent form of dance throughout the ballet. That in no way means that there were not moments of beautiful, challenging dancing. Those moments stood out and received loud applause from the audience. However, I have seen productions with choreography that has showcased the dancers’ talents in a more obvious way. Among all of the breathtaking scenes, it was difficult to decide which scene I enjoyed the most. I narrowed it down to the Act I Scene I, the opening scene. It did a fantastic job of setting the tone, setting, and vibrancy of the rest of the ballet. In this scene, the audience is introduced to almost every character in the production. It was fun to see all of these characters interact with each other, and the dynamics of each relationship. This was a scene that balanced the use of acting and dancing. It was telling a story, but there were also moments when the dancers were able to show they beautiful abilities. To have a ballet begin with such energy, and never lost it throughout the three acts. Students from Lesley were able to enjoy this show by getting discounted tickets from the Student Information Desk. They have also offered other shows at the Boston Opera House such as Waitress in February. Through this method, students can experience the theater without having to save up hundreds of dollars to buy a ticket. Lesley should continue to do this, as many students attend the shows, and it gives college students a chance to experience a kind of culture they would otherwise not have been able to afford.